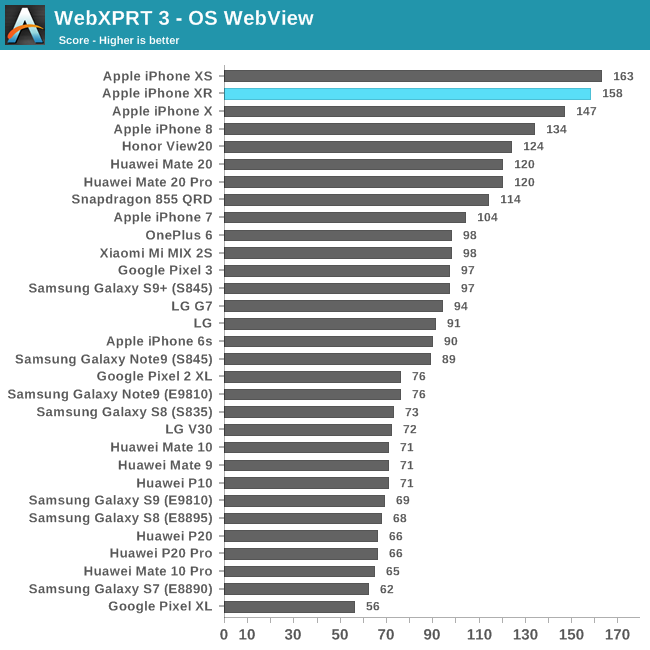 System performance of the iPhone XR isn’t something that we expect to differ from the higher-end XS models. Here Apple employs the same SoC at the same clocks, and fundamentally there isn’t any technical reason for the phone to perform differently in every-day tasks. It’s to be noted that our iPhone XS review models were of the biggest storage capacities – both at 512GB, while the iPhone XR model tested today is a 64GB variant. I’m still working on getting our mobile NAND testing suite modernized, but I do expect a difference in speeds here as the bigger storage variants allow for better NAND die parallelism on the part of the storage controller. As expected, the iPhone XR performs within the margins of error for the iPhone XS. Which means it’s at the very top for mobile performance, currently outperforming every other device, and we’re not expecting this to change anytime soon for 2019 (at least until Apple's A13). In our review of the iPhone XS, we dedicated a lot of analysis to the A12 and we were just impressed with the performance of the chip as well as Apple’s new CPU microarchitecture. Since then, we’ve had the opportunity to test the newer generation SoCs from HiSilicon as well as Qualcomm, both employing Arm’s new Cortex A76 CPU cores. 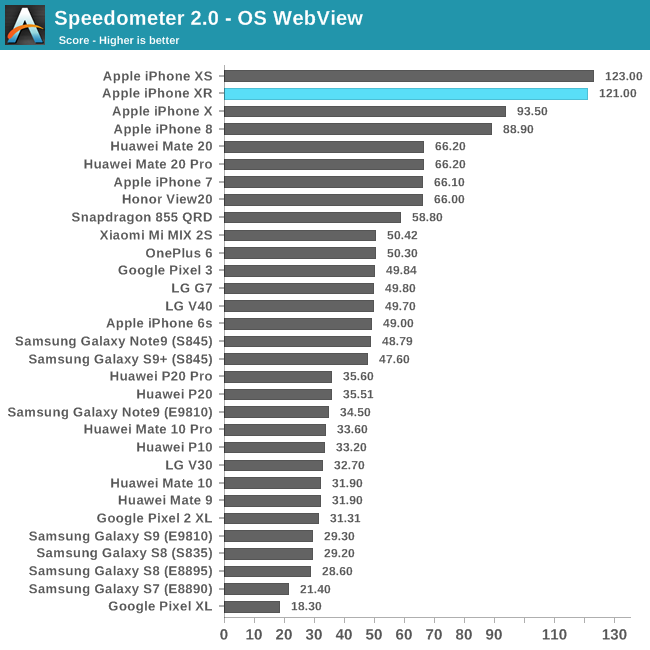 While both SoCs have shown fantastic gains, especially in regards to energy efficiency at peak performance, absolute CPU performance and ISO perf/W of the Android vendors are still very much lagging behind Apple’s best. As a result, these latest-generation Android SoCs are having trouble competing with even last year’s A11, never mind the A12. 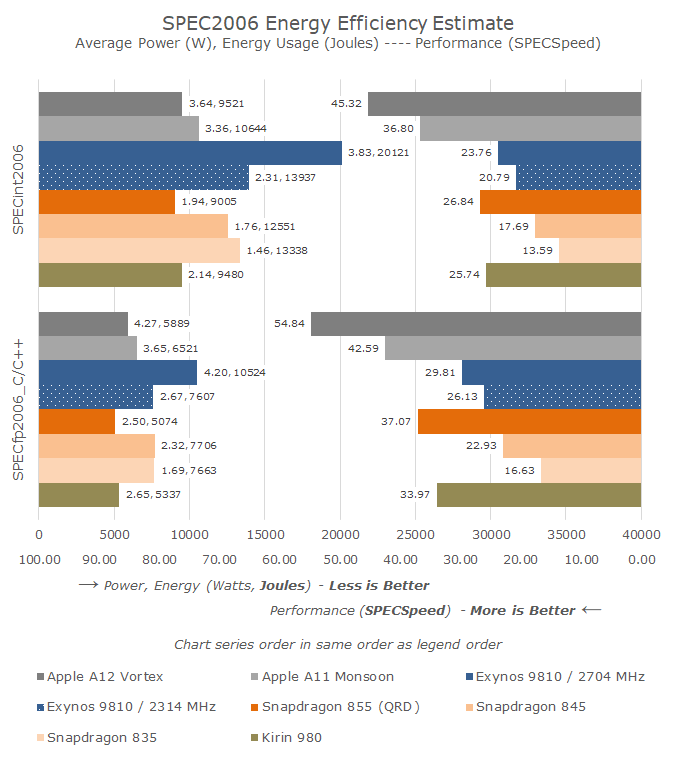 The new Exynos 9820 is the only other important chip for 2019 on which we don’t have data on – and I’m not expecting any miracle on Samsung’s side, which means the A12 and subsequently the iPhone XR will remain very much a top performer for the rest of the year.